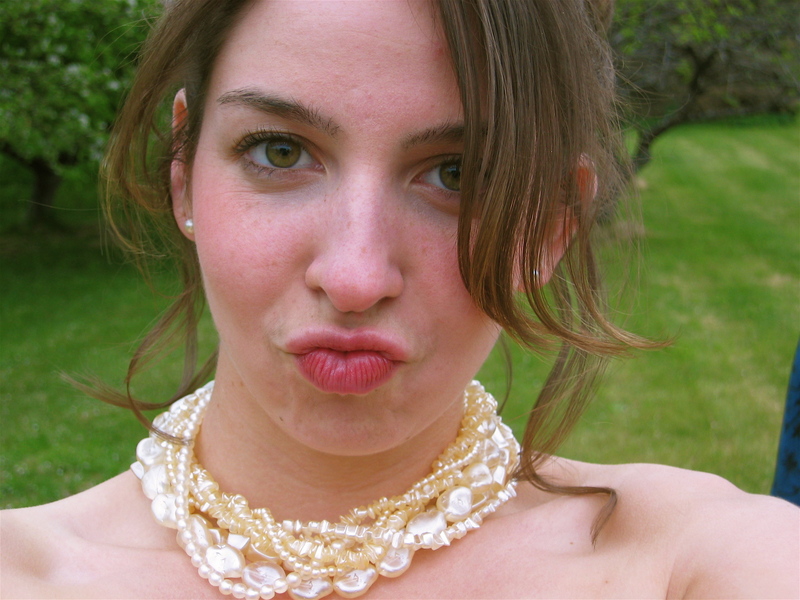 An email from Lauren brought me back to those last years of high school and the ritual of the PROM. I’m not sure what the name really stands for and am not interested enough to Google it. Unfortunately it is tucked away in the summer cabin North of here under 7 feet of snow so no photos are readily available. It is yellow satin with a heavy french lace overdress. The neckline borders on “turtleneck” status and the bodice is tight. From the puff shoulders to the six-button cuffs, there is no skin visible. My mother and I picked out the pattern and had it made by her dressmaker. We went on a mission to find just the right lace and shade of satin. 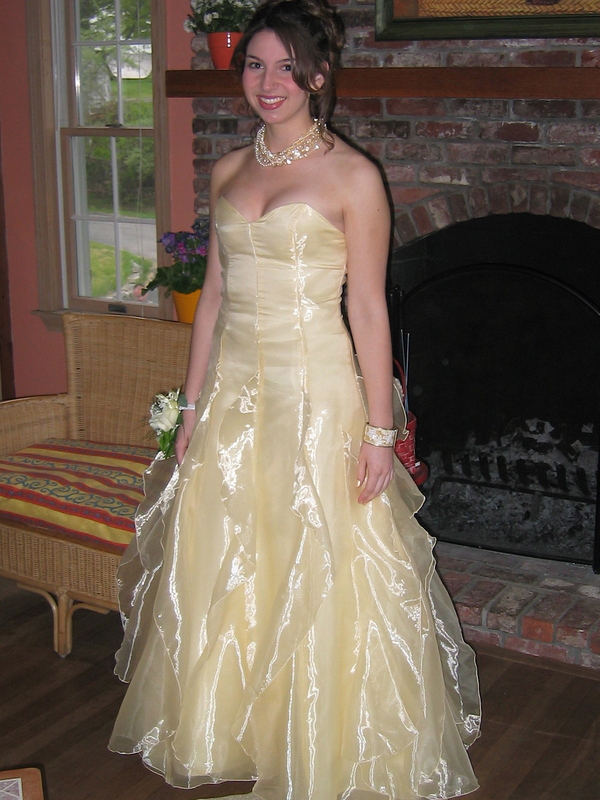 Lexie’s first prom gown also in yellow, note the dramatic make up and hair? Very 2005 and very Lexie. Do Mermaids come in Yellow?? In the early 1970s you went with a date or you didn’t dare show your face. Your date’s cumberbund matched the color of your dress but beyond that it was a miss-mash of 1960s hippy meets disco with a nod to Hollywood romance. Lexie’s crew went en mass, some were dating but it wasn’t a prerequisite for the evening. I went during the mid 80s, so my fashion icons were Princess Diana and Madonna. My gowns were ruffled and had puffy sleeves and I made my necklace, using velvet ribbon, thinking I was on par with Diana. I also did lace fingerless gloves–a shout out to Madonna. I mean, it was so bad, it was almost good. I had my proms in the decade after the Little House on the Prairie look was big, and before sequins made their entrance. This entry was posted in memoir. 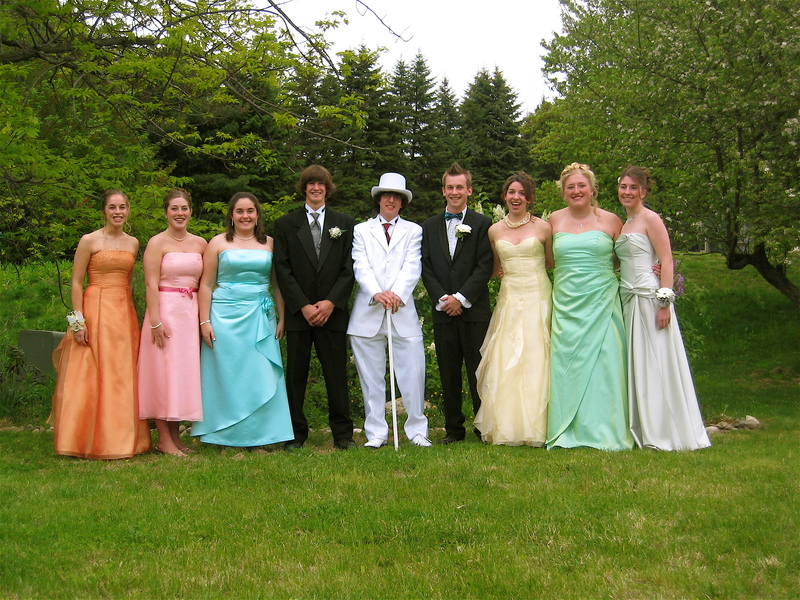 Tagged dating, high school rituals, memoir, Prom gowns, Proms. Previous Post Previous post: Just get out! I went stag to my senior prom. I wasn’t dating and was leaving for boot camp in a month or so. Lucky for my the ’80s were a time when stag was ok. I didn’t stay long after the meal and couldn’t begin to tell you what I wore. “Gunnysak” was the “dress to be in!” I didn’t lose my virginity or get drunk that night like so many of my friends. I was glad to leave highschool behind and start my adult life! “…and start my adult life!” Ha! I had to laugh at that Laura!! I love these!! Your daughters are beautiful and what great fashion sense each of them has! It’s so much better, isn’t it, the way young people are doing things like proms? Much less rigid and exclusionary than what I remember (I didn’t go to my own senior prom at all), and they look like they’re really enjoying themselves. Agreed Beth, it is better that the old rules of having to go with a date are gone. I think everyone has more fun and makes better memories! Prom is short for promenade. 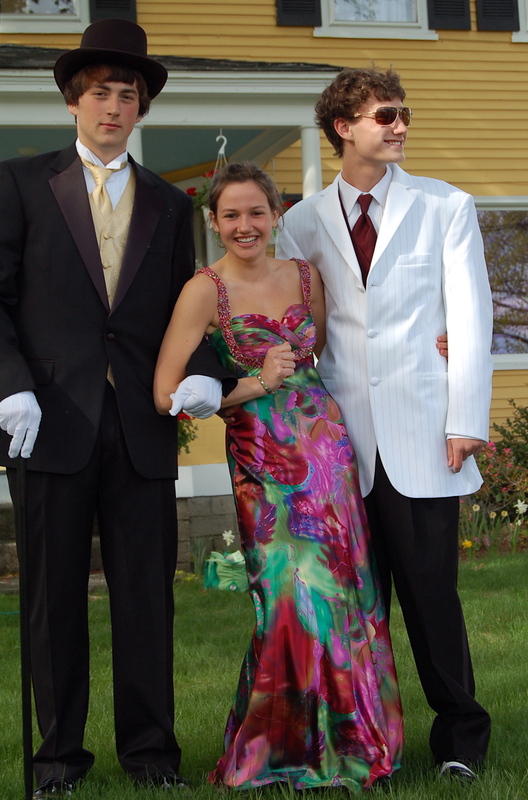 My memories of senior proms are not so good due to that “have a date” thing and I’m delighted to forget it. Thanks Aline! I did make it to at least one prom but beyond the dress I can’t remember much else! In the early 70s, you had to be asked to the prom. There were no singles and girls did not ask boys. Alas, I never attended. It was much more rigid back then, wasn’t it Joyce? Nice to see things have lightened up and everyone gets to go!! Yes, although I think it’s become too much of a competition and way too expensive. Your girls look lovely, I wish there was a photo of you too though. 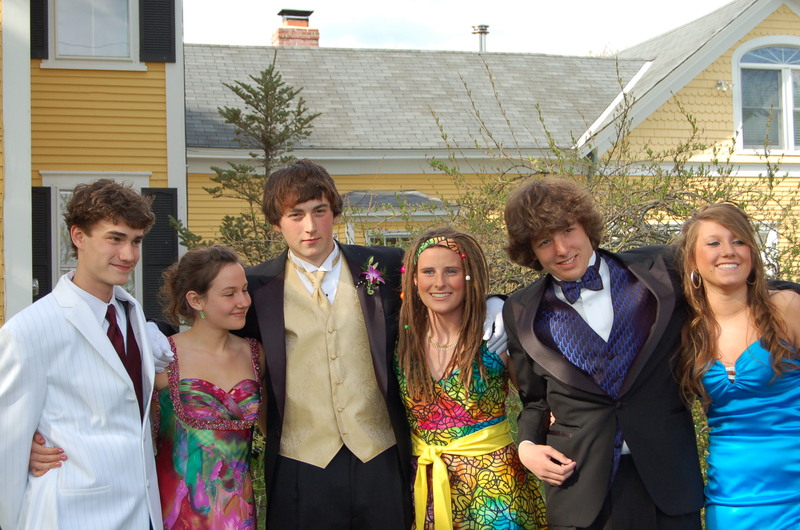 The prom didn’t arrive in the UK until fairly recently so I didn’t have a prom dress or a prom. We do have them here now, the youngest of my three boys went but they didn’t have them for the oldest two. It seems to be quite expensive for the mothers of girls, with dresses that cost more than my wedding outfit and a limousine, which I most certainly didn’t have for my wedding. My son wore a suit with a black shirt and white tie and went on a motorcycle. Hi Marie, yes, the expense is rather out of control!